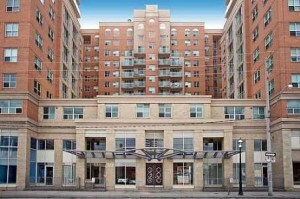 Stunning Corner Condo @ The Richmond. Spectacular Southeast Suite W/800+ Sq Ft Of Urban Space Boasts: Gleaming Hardwood Floors, Culinary Kitchen Has Luxurious Limestone Floors Overlooks Private Dining Area, Spacious Living Room Leads To Open Balcony, 2 Large Bedrooms Both Outfitted W/Closets, Master Has Ensuite Bath, Two(2)Owned Lockers, One(1)Underground Parking Spot Complete Your Wish List. Premium & Practical Layout Is Steps To Downtown Core. A Must See! 2 bedrooms, 2 bathrooms, with 1 parking space and 2 lockers.